The global mammography systems market has highly competative landscape, observes Transparency Market Research (TMR). 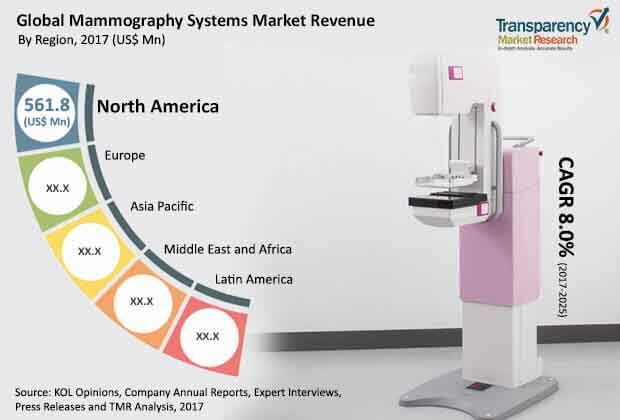 Some of the key players operating in the mammography systems market include Hologic, Inc., Allengers Medical Systems Limited, FUJIFILM Holdings America Corporation, Konica Minolta, Inc. Most companies focus on new product launch to expand in the mammography systems market. On December 28, 2017, PLANMED OY received the United States Food and Drug Administration (FDA) approval for the Planmed Clarity 2D full-field digital mammography system. According to the report, the global mammography systems market was valued at US$ 1.5 Bn in 2016 is projected to expand at a CAGR of 8% from 2017 to 2025. The report suggests that surge in incidence of breast cancer is anticipated to drive demand for mammography systems from 2017 to 2025. The digital mammography systems segment accounted for major market share in terms of revenue in 2016. North America dominated the global market in 2016, followed by Europe. Advancement in technology and awareness about breast cancer and associated diseases are the key factors driving the mammography systems market in these regions. Breast cancer commonly occurs among women aged over 40 years. Usage of X-ray to screen breasts is referred as mammography. Mammography is considered to be a standard imaging tool to detect breast cancer. Mammograms are of two types: diagnostic mammogram and screening mammogram. Diagnostic mammography is performed in women who show symptoms of breast cancer. Screening mammography is performed in women who are asymptomatic. Women with high risk of cancer are advised to undergo mammogram more frequently as compared to women with no or lesser risk of cancer. The two types of mammography systems are analog mammography systems and digital mammography systems. Analog mammography is one of the early techniques used for breast cancer screening. The digital mammography system is also called full-field digital mammography (FFDM). It is a mammography system, in which an X-ray film used in the analog mammography system is replaced by electronics that convert X-rays into mammographic pictures of the breast. Rise in awareness about breast cancer screening programs and technologically advanced mammography systems propel the global mammography systems market. A shift from analog mammography systems to highly advanced digital mammography systems propels the mammography systems market in North America and Western Europe. These regions are likely to account for significant shares of the global mammography systems market. Changing dietary habits and sedentary lifestyle trends in emerging markets such as China and India are expected to fuel the growth of the mammography systems market in Asia Pacific during the forecast period.